The ultimate action-fueled end-of-the-world conspiracy trilogy from #1 New York Times bestselling author D.J. MacHale THEY CAME FROM THE SKY parachuting out of military helicopters to invade Tucker Pierce's idyllic hometown on Pemberwick Island, Maine. 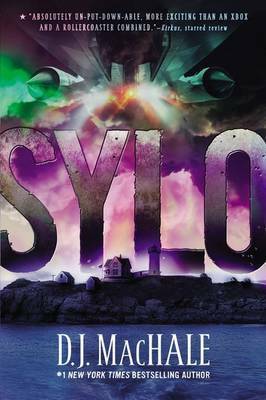 They call themselves SYLO and they are a secret branch of the U.S. Navy. SYLO's commander, Captain Granger, informs Pemberwick residents that the island has been hit by a lethal virus and must be quarantined. Now Pemberwick is cut off from the outside world. Tucker believes there's more to SYLO's story. He was on the sidelines when the high school running back dropped dead with no warning. He saw the bizarre midnight explosion over the ocean, and the mysterious singing aircraft that travel like shadows through the night sky. He tasted the Ruby--and experienced the powers it gave him--for himself. What all this means, SYLO isn't saying. Only Tucker holds the clues that can solve this deadly mystery. LOOK TO THE SKY because Pemberwick is only the first stop.